Huaraz is a small provincial town, the capital of Ancash province. But it's also the climbing capital of the Cordillera Blanca & the centre for trekking & climbing in Huayhuash and the town is thronged with tourists. Food (& beer) happen. 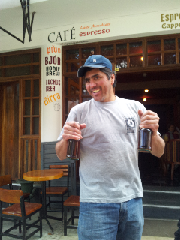 The picture is of Lucho with his famous hops & coca beer.